Is it likely that our industry's independent sales reps will remain relevant? Will traditional representatives even exist 10 years from now? Ed says yes, and Bill says no. Editor’s Note: Here's more from Furniture World's point/counterpoint duo Bill Napier and Ed Tashjian. Sales representatives will not only survive, but they will evolve to become the single most important element of the retail relationship. Obviously, their skills will need to evolve with business conditions and technology, but I can’t imagine our increasingly commoditized home furnishings industry without sales reps, and here’s why. off the top for doing mindless tasks like scanning swatches, checking to see that the catalogs are in place, being garrulous and going to lunch. Unless you have actually carried a furniture bag, you may not have an appreciation for the nuanced tasks that skilled sales people perform every day. Furniture has always been a relationship business. For most retailers, this relationship isn't primarily with the factory, it's with the rep. You often see retailers following reps when they change factories. Sales reps prospect, open and cultivate accounts. They not only have relationships with owners and buyers, but also with sales associates on retail floors. They are the “face" of the manufacturer to the floor salespeople. That's the level where decisions are made as to what products are shown and sold to prospective customers. Retail associates associates often prefer to call on their reps for answers, rather than ask store management or look up the information themselves. and every designer or retailer does not receive the same deal. Professional reps know how to work the system, customer service departments and manage the managers. They also know that their wages are paid by retailers. Commissions just pass through manufacturers. In most cases, manufacturers reps heavily influence retail merchandising They are in stores every day and most weekends. They are where the money changes hands versus an ivory tower person (like me) who makes decisions by looking mostly at data. Not only do they know what is selling where and why, they’re the ones who prevent retailers from having the same items on the floor as competitors across the street. that need to be interpreted and explained. Somebody has to take the heat. Someone has to develop and maintain relationships. It requires temperament, persistence and humility— something that management in my experience has in short supply. ​The Way Of The Dodo? decisions are made at headquarters? Let me remind you of what happened when Thomasville unceremoniously fired its sales force in a single conference call. It just sold for a fraction of what it was at its peak. Vertical stores still need trainers, merchandisers, and local analysts which cost much more than what they get from reps for free. And if retailers think manufacturers are going to give them all or part of the sales commission formerly paid to reps, they are sadly mistaken. Manufacturers are barely profitable now. can keep it all for ourselves? First, independent reps are economically practical. The more they make, the more the company makes. Their incentives are aligned, and it is foolhardy management that tries to restrict how much a salesman can earn. Second, and this is what people forget who have expense accounts, company provided healthcare, an office and supplies. Independent reps pay for these "benefits" themselves. Substantial traveling and prospecting costs are borne by reps. The arrangement is virtually risk free for the factory. Company employees cost far more, and they have little or no incentive to stay past 5PM or work weekends. also reps who set up the likes of Wayfair and Amazon accounts, interface with them and makes sure the e-tailers' databases are populated. age, it’s about trust, and an attitude of being young at heart. Great salespeople do not sell. They educate and inspire. No one wants to be sold, but everyone wants to make informed and relevant decisions. explain the uniqueness of the products, the color story, their promotional calendars, and the changes within their company. Would a bland power point presentation have the same impact? Do we really think this factory approach can succeed as well as a rep who understands the store's point of view? Some will ask, why do we need reps? They say that all of the important information can be found on manufacturers' websites. A rep I highly respect compares this to a car owner's manual. will help retail staff to make the most of any retailer-manufacturer relationship. hired to make their quotas. It's a big mistake. And retailers need to appreciate what the great ones bring to the table and reward them for it. True rep partners have a vested interest in the success of both their retail customers and the ​manufacturers they represent. What will the successful sales rep look like in 2028? What existing skills will they need to maintain, and what new skills will they have to develop? to tie into store security cameras or mount their own to monitor floor placements and traffic remotely via computer. They will also become experts in AR and AI. Presentations will involve 3D and showing fabrics and frames in the store environment so that store management, staff and end consumers can better visualize the benefits of their products. industry. Ten years from now we may change what we called them, but they will always be the centerpiece of successful manufacturer-retailer relationships. Wow, Ed did a great job and is totally “on point”, but I do have an issue with his analysis based on my relationships with hundreds of reps over my career as CMO of several furniture companies. and associated elements to help reps show and sell more, I was often dumbfounded by their lack of commitment, knowledge, and understanding of management's goals as it related to marketing materials. I actually used to get calls from reps who told me, “It’s NOT my job to sell marketing stuff. My job is to sell furniture”. WRONG! It is your job to execute for the factory, flawlessly, what they want and need to get done. Ed and I are in the business of supporting manufacturers through a variety of means. One important marketing tool we create for our manufacturing partners-clients are online “Marketing Resource Centers” created to allow reps and retailers to easily access manufacturers' marketing materials. These web platforms are set up so that marketing managers can track usage. Guess what? Traffic on these sites is dismal in most cases and I think I know why. It's because most reps feel it's NOT their job to promote marketing and advertising in the store or out of the store. They believe that their job is to sell furniture. Studies show that people recall only 10 percent of what they hear, 20 percent of what they read and 80 percent of what they see and do. Furthermore, 93 percent of all communication is non-verbal, and visuals are processed 60,000 times faster than text. So those reps who think marketing, advertising and promotional materials are irrelevant to their job description need to rethink that position. I’ll wager that over 90 percent of all sales reps have no clue how marketing platforms influence consumer purchase behavior. I’ll bet they have no clue regarding the demographics of consumers who control the buying power in our category. I’ll bet they have no clue what zip codes around their dealers' stores have attractive marketing indices as measured by low-high propensity modeling (propensity to buy or consume). I’ll bet many don’t even know what marketing indices are. to the furnishings sales process. They’re either too busy, not interested, or deem it irrelevant. You can Google what makes a great salesperson and most answers are in line with what Ed said earlier, with the exception of “market knowledge”. Confidence, having product knowledge, excellent listening skills, showing empathy and being known for integrity are great attributes, but most of the definitions I read, excluded market knowledge. None of those attributes, in my opinion, matter unless you know your customer, now and in the future. I agree with Ed about the relationship aspects of rep's jobs. Many reps are invaluable to their retail customers who will follow them if they change lines. I have witnessed that a few times, but I also know that many, many retailers complain that their reps don't add value and they’d be better off using reps' commissions to further their store’s marketing and selling efforts. They say they just don't need someone to show them pictures and price lists, they need them to help create sales velocity, PERIOD! So, here's a five question short quiz for reps as well as sales and marketing people who hire and supervise them. I hope you will cue the "Jeopardy" music before reading them. partner to help your retail customers create velocity, not just "floor" inventory. Unfortunately, most reps don’t do that. If you are one of those reps, and you have high expectations for your career, good luck to you! What percentage of consumers start their search for furniture on the internet? What demographic is responsible for over 50 percent of all household purchases? How much do they spend each year? What percentage of disposable income does this demographic control? What marketing/advertising element is the most influential when consumers research home furnishings products? What are the most influential technologies that can help retailers sell more of your stuff? What is the most hated marketing/advertising venue? Define what I mean when I say: “The Arrogance Of Ignorance”? ​Stop the Music -Times Up! Over 80 percent, some say more than 85 percent of consumers start their search for furniture on the Internet. Why is this statistic important? It's because not many reps work with their retail customers to create GREAT website content for products that can engage consumers and generate traffic. Content is "KING", and reps who fail to supply retailers with more than photos and short factory written descriptions, which most likely stink, they haven’t done their research as to what, why and how consumers are influenced to make purchase decisions. it comes to home ownership. study, about 80 percent of U.S. households still use circulars and other traditional, printed sources for product information. Thisincludes print circulars at 85 percent,and circular via the store at 79 percent. Consider also that direct mail has a 30 times higher response rate than digital according to Forbes. Actually research shows digital advertising has a .62 percent response rate, vs.direct mail at 4.4 percent. Another easy one:Digital Ads are the most hated, even your precious Millennials hate them! Tashjian Marketing provides senior marketing leadership to the Home Furnishings Industry. It specializes in business analytics and in helping its clients to segment the market, define and communicate a sustainable differentiated value proposition. Get more information at www.Tashjianmarketing.com or call Ed at (828) 855-0100.
small, medium and large companies throughout his career, most notably Ashley Furniture Industries. 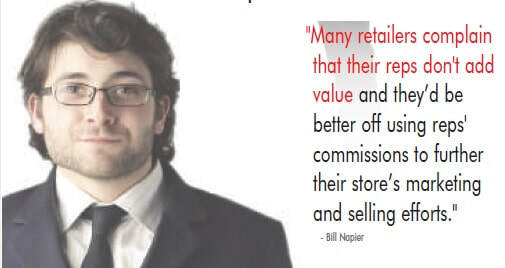 Bill is also a featured writer and speaker in the retail industry. His passion is to help retail brands & brick mortar retailers grow their businesses by creating, guiding and deploying successful marketing B2B/B2C solutions integrating traditional marketing with the web/ social media. He has demonstrated this with his FREE website www. social4retail.com with hundreds of articles and “how-to” strategies for retailers and brands. Reach Bill at: billnapier@napiermkt.com or 612-217-1297. See all of their commentaries at https://www.furninfo.com/Authors/List.